INDIANAPOLIS -- Five women were rescued after their kayaks overturned during a birthday outing on the White River on Saturday. Crews with the Indianapolis Fire Department and the Indianapolis Metropolitan Police Department responded to the White River near Meridian Street and Holliday Park for a report of at least five people who fell into the water just before 3 p.m.
Indianapolis Fire Department spokesperson Rita Reith said all five victims are in Indiana visiting family and are from either Texas or Ohio. The women were kayaking on the White River to celebrate one of their 60th birthdays. The women were sharing three kayaks when one of them got stuck in debris. When the other two tried to help, all three of them overturned, tossing the women into the water and sent their life jackets downstream. 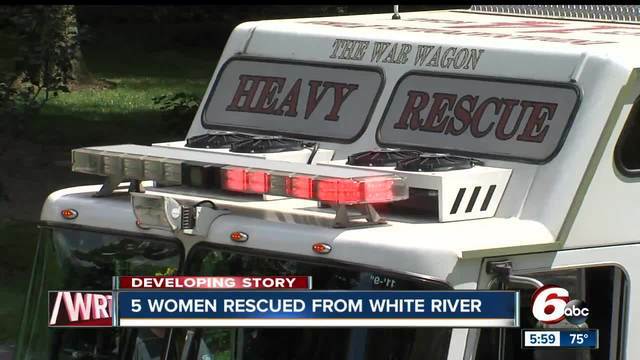 The women were carried by the current from 64th Street down to 16th Street and rescued in three different locations. "It was either me or the canoe," said Veronica DeLeon. "I chose me." While crews were rescuing three of the women they encountered two men whose kayak had overturned in the river and another kayak trying to help them. Rescuers were able to stop and assist the men with turning their kayak upright and returning to shore safely.